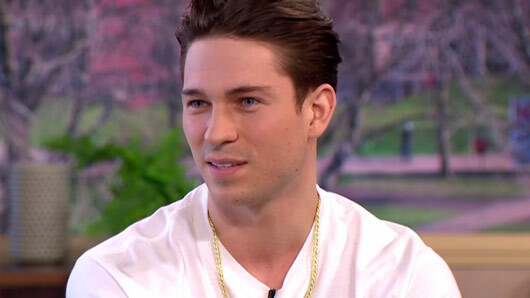 Celebs Go Dating‘s Joey Essex accidentally dropped the F-bomb live on air during his appearance on This Morning. And it was all over a strawberry. The former TOWIE star appeared on the ITV daytime show today to discuss his time on Celebs Go Dating, and of course Joey managed to cause a scene before even making it to the sofa. During a link, the reality star was shown sitting in his dressing room eating a selection of strawberries and chocolates. After Joey chatted briefly about his upcoming appearance, the picture switched back to Gino in the This Morning kitchen. However, Joey’s microphone was left on and viewers at home were able to hear him swearing. Hosts Holly Willoughby and Phillip Schofield later apologised for the slip up, with Phillip joking: “I never knew he knew words that big, actually”. Viewers at home didn’t seem all that fussed. In fact, many fans of the show took to Twitter to share their enjoyment over Joey’s outburst. During Joey’s interview, the star revealed that he would be paying more attention to the dating agents on Celebs Go Dating this time around, after his relationship with Stephanie Pratt came to a miserable end last year. When asked about his idea of a romantic date, Joey also confessed that he had once taken a date to KFC: “I took her to KFC, but I’ve got a black card, it’s metal and everything, and you can get £200 a day on it. Celebs Go Dating continues weekdays at 10pm on E4.